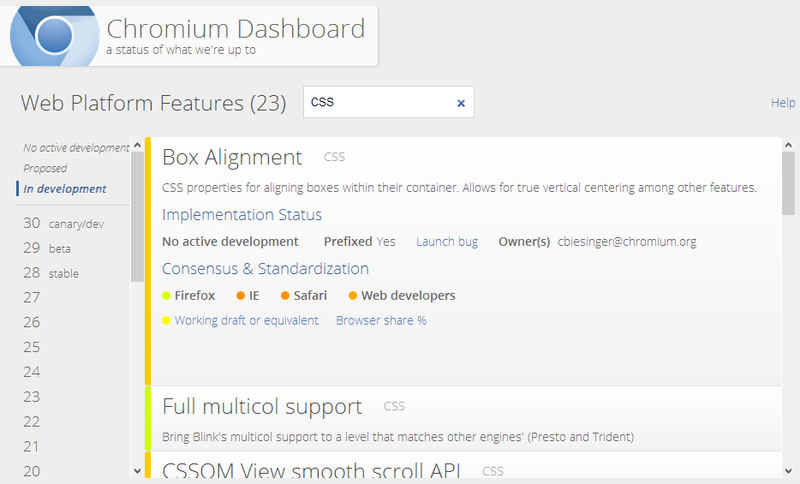 Google today announced it has revamped the Chromium Web Platform Feature Dashboard, which is used to track new feature development within Blink, to better illustrate what specifications other browser vendors are backing. While the tool has been valuable for the company so far, now it is looking to make it easier to use for everyone. In this way, the company hopes “to encourage transparency and to consolidate web platform feature tracking.” While the former is definitely possible, the consolidation is unlikely as Google is only adding features that it wants to add to Blink, meaning there is a big potential for leaving out what other browser vendors are adding but Google is not. A short description and owner email address. Progress through the standards process. Our understanding of the opinion of other browser vendors. Furthermore, each entry is color coded as different shades of red, yellow, or green based on how likely it is that the feature will ship in other browsers. If a feature is completely green, the specification is considered to be stable and publicly endorsed by other browser vendors. Bidelman also says this is the first iteration of the new version, and Google is planning to explore different ways of exposing the data. The code is available on Github and the company is recruiting help with both content curation and coding.